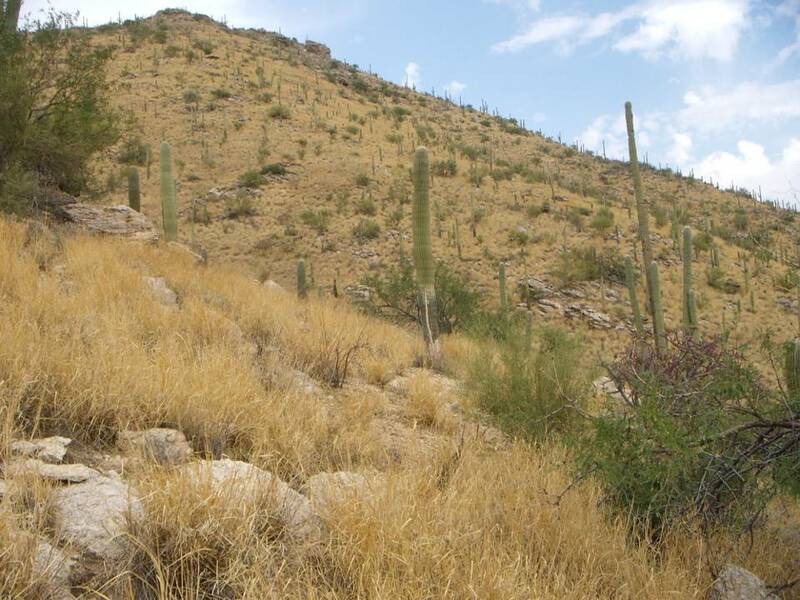 Buffelgrass, an invasive perennial grass that out-competes native plants, threatens to transform the current Sonoran desert landscape. Buffelgrass treatment is most effective with herbicide, which kills the plant while it has actively growing, green leaves. To maximize the efficiency of treatment sprays, managers need to know both where grass is growing and when the plant is at least 50% green. Buffelgrass generally puts on green leaves after rain, and goes dormant during other times of the year. Due to the difficulty in predicting the timing of precipitation, and how long after precipitation buffelgrass will green up, managers are unable to strategically apply herbicide. To optimize the use of remote sensing data to detect the location of buffelgrass and predict when it is green, the authors of this study combined National Park Service buffelgrass distribution information, Moderate-resolution Imaging Spectroradiometer (MODIS) satellite imagery of when landscapes appear green, precipitation data, and observations of buffelgrass phenology collected through Nature’s Notebook to map the locations and phenology of buffelgrass. By comparing these data sources, the authors found strong correlations between on-the-ground observations of green buffelgrass and MODIS greenness. They found that buffelgrass responds quickly to rain, with plant green up occurring twice as fast in areas with buffelgrass than areas with mostly native vegetation. This study is a direct application of phenology information collected by Nature’s Notebook citizen scientists. By knowing how best to predict when buffelgrass will green up based on precipitation, managers can know when to get boots on the ground to effectively treat the grass. Studies such as this one, which integrate on-the-ground observations of phenology with satellite data, demonstrate the power of combining multiple data sources to inform management activities. The authors also demonstrate the importance of precipitation to a dryland species that does not follow the typical seasonal changes seen in temperate regions. The techniques introduced in this article will be useful beyond predicting phenology of buffelgrass, and can be applied to other dryland species with phenology that is tied more closely to precipitation than to changes in temperature. If you live in the southwestern US, you likely enjoy seeing the iconic saguaro cactus dotting the familiar landscape along with palo verde, mesquite, desert annuals, and other Sonoran native species. With a buffelgrass-dominated landscape, fires will burn the landscape hotter and more frequently, which could eliminate both native plants and their seed bank. The resulting landscape would become a monotypic grassland that would not support many native plants and animals. This study has implications for other dryland ecosystems where plants respond rapidly to periodic precipitation. The methods will be valuable for predicting the timing of transitions in other dryland species, as well as for mapping invasive species.